Background: In flowering plants, development of seeds is initiated by double fertilization. During double fertilization, one of two sperm cells fuses with the egg cell (a female gamete) to produce an embryo, and the other fertilizes the central cell (another female gamete) to produce the endosperm. Endosperm is a seed structure that provides nutrients and signals for embryo growth and seedling germination. In cereal crops, the endosperm constitutes a large proportion of the mature grain and accumulates large amounts of organic compounds, including starch and storage proteins. As such, cereal grains are a primary source of human calories and industrial raw materials. Question: The maize transcription-factor protein Opaque-2 (O2) directly regulates nearly all the genes encoding major seed storage proteins. O2 also regulates genes involved in a diverse set of biological processes, including synthesis and metabolism of carbohydrates and lipids; nevertheless, whether these processes are directly or indirectly regulated by O2 remains unclear. We asked what the direct and indirect target genes of O2 are and how are those genes regulated by O2 during endosperm development. Two distinct modes of gene activation by O2. Findings: We identified 186 putative direct O2 targets and 1677 indirect targets, encoding a broad set of gene functions. We observed at least two distinct modes of gene activation by O2. Two O2-activated genes, bZIP17 and NAKED ENDOSPERM2 (NKD2), encode transcription factors, which can in turn coactivate other O2-regulated genes. NKD2 was previously shown to regulate development of the aleurone, a specialized endosperm cell type that functions during seed germination to digest the compounds stored in the endosperm. 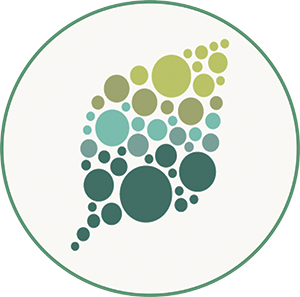 These results provide novel insight into O2’s role in the regulation of endosperm development and function. 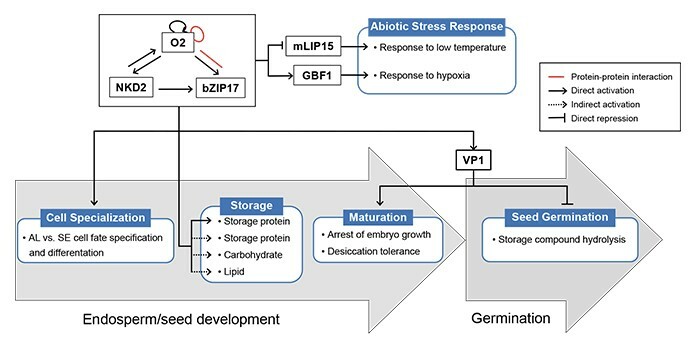 Next steps: A spatial (and temporal) analysis of gene activities in endosperm cell types of single mutants and higher-order mutants of O2, bZIP17, NKD1, and NKD2, etc., is necessary to fully understand the downstream genes and processes controlled by these transcription factors.